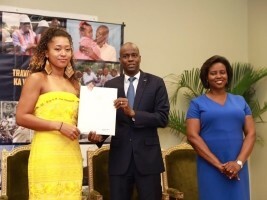 Wednesday, at the National Palace, President Jovenel Moïse received the Haitian-Japanese star (also an American national) of world tennis (5th) Naomi Osaka. During a ceremony, the Head of State appointed her as Goodwill Ambassador for the promotion of Haitian sport and took the opportunity to give her a plaque of honor, in the name of the Republic as a sign of our gratitude. That same day Naomi Osaka, who is not at her best (affected by a flu), flew to Jacmel with family members where she inaugurated in Morne Ogé, the newly renovated school, founded by Maxime Léonard François, father of the champion. The Deputy Mayor of Jacmel, Mrs. Marie Lourdie César, took the opportunity to hand the key of the city to the champion of the US Open against the former world number 1, the American Serena Williams https://www.haitilibre.com/en/news-25476-haiti-flash-the-haitiano-japanese-naomi-osaka-wins-the-us-open-against-serena-william.html in the presence of het parents, managers and students of the school, as well as many media to welcome the player. Loudie César took the opportunity to offer Naomi and his family presents made by craftsmen Jacmel.